I fit 9 out of 10!!!! You nailed it! I was smiling at 10, giggling by 6, and laughing out loud by 1. I'm a diehard Scottie Mom!! You got me on no. 5...sitting at this very moment typing this and looking at the pics of my two boys on my desk! Haha, these are all so true! Just some of the great things that come along with loving the best breed of dog there ever was! Wow - have you been following me around with a hidden camera?? LOL. You forgot.....Her Scottie has his/her own Facebook profile. All of this fits me to a tee! My children tell me that I baby my scotty babies more than I do them. lol, We do love our scotties. Thank you for the laughs! Scotties are irreplaceable friends. THE BEST! I miss my "Robbie" (Robert the Bruce) soooooo much! Listen Mom! 1 out of 5 Scotties dies of KIDNEY FAILURE, and there are often ZERO symptoms! GET YOUR SCOTTIE'S KIDNEYS CHECKED EVERY YEAR! Yup...this is my mom all the way! Ok, I'm guilty of being a Scottie Mom (times 3). I have a Kate Spade Scottie IPhone case and lots of other Scottie stuff. Sounds like me. Especially the one about all the Scotties stuff around the house! 9 out of 10 for me! The picture thing threw me out of the 10 for 10. I give all these 10 Arooo's up!! 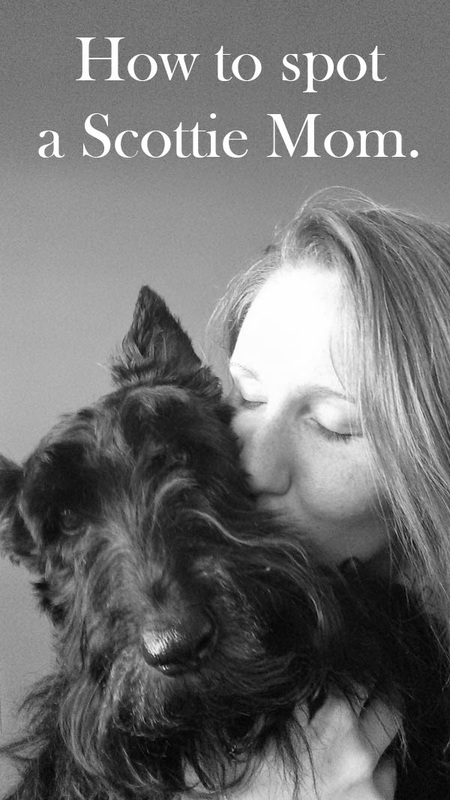 And when a Scottie Mom looses her "heart" dog, she grieves more than if she'd lost a human family member. Hmmm, does this work for Cairn moms too...we are of Scottish descent, you know and I am pretty sure the majority of these "signs" would apply to my mom. You can apply most of those to Scottie Grandmas, too! They forgot the most important one. I always say a house is not a home with out a Scottie! OK, that's me. Decorated the cover of my kindle with Scottie duct tape. Buy almost all the Scottie clothes and give them away to foster kids. Maybe they will have a Scottie in their lives one day. I have clothes with scotties on them. Hoodies & even Christmas sweaters. And yes, our scots go everywhere with us. I was at Michael's today and they have darling Scottie things for Valentine's Day. You send your Scotties postcards when on vacation. And don't forget our love for tartan fabrics! How embarrassingly accurate! Now, if they would only come out with a Scottie emoji!